To enable the CS2 signal add another element to the struct as shown below but disable the TTY0 peripheral (/dev/tty1 device). Note that on the Terra-M board this line is used by the GPRS modem. Compiling Linux Kernel 2.6.39 for the Aria G25 SoM. Compiling Linux Kernel 2.6.38 for FOX Board G20 and Netus G20. 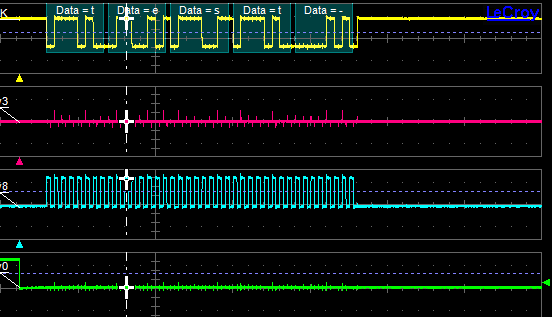 As stated before the SPI mode is an important parameter that should be trimmed according to your slave device and in accompliance with the modes available here. 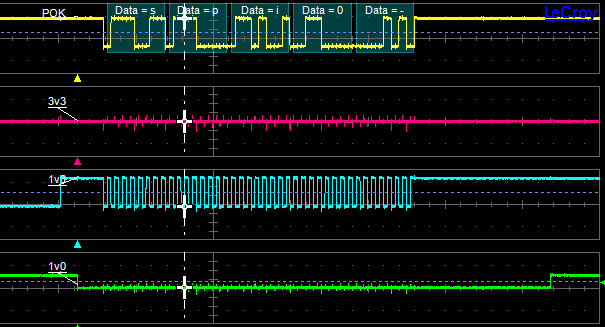 Now follow some graphs of the spidev behaviours captured with an oscilloscope. In the following images the cyan trace is the SCLK signal, the yellow trace is MOSI signal and at the end the green trace is n-th CS. Note that the training char in the captured image is a carrier return introduced by echo. echo test > /dev/spidev1.1* command as spidev writer. Note that using a mode1 the behaviour of clock signal is different. Note that in this final capture the mode is the binary OR of more than one flag defined inside spi.h kernel header. The captured traces show also that the byte-ordering is inverted due to SPI_LSB_FIRST flag and also that only 4 char are sent on the bus due to the -n option of echo command that supprime the carrier return.